Fortunately, the township will be able to repair them. GOSHEN, Ohio -- Miami Township resident Brent Bergman travels to the Goshen Cemetery every two weeks to visit his family's graves. Over the weekend, the 25-year-old found downed tree limbs, a broken vase and a tombstone moved, all of which he believed to be caused by last week's storm. "It just gets aggravating when you've got loved ones in here and, you know, they want to rest in peace. ... I don't want to see a tree on top of their gravesite," Bergman said. Bergman said he had previously called Goshen Township and asked for the trees to be cut. "They said they'd have somebody come out here and cut them down, so I showed up probably a month and a half later since I called them and found a tree down on a bunch of grave sites," Bergman said. Goshen Township has since cleaned up the downed branches and repaired the broken vase. 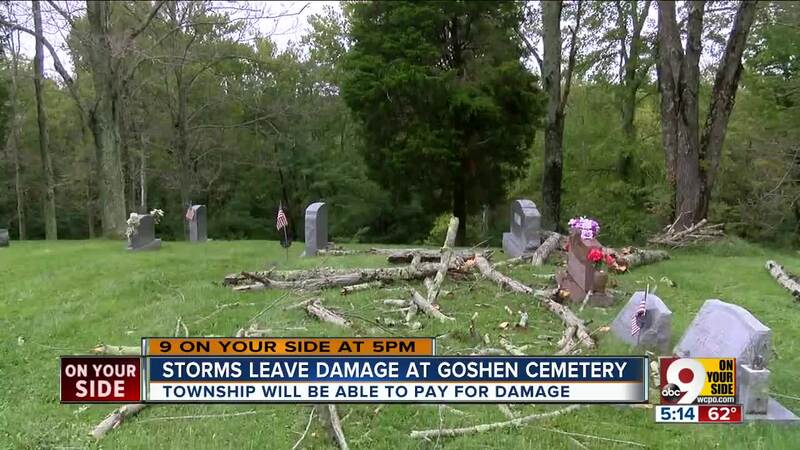 "Apparently a tree branch not a tree that is not on the township property but is next to our cemetery property fell from the storm over the weekend and broke a vase that somebody had placed on a headstone that had flowers on it," Goshen Township administrator Steve Pegram said. "The headstone did not break, and it's not damaged -- just a vase broke." Pegram said the township will pay for any damage, and the service director will replace the vase free of charge. "I'd like the dead trees cut out of here," Bergman said. "The dead one back here by my brother and mom's cut out, and just replace the vase and clean up the area and make sure this doesn't' happen to anybody else." Pegram says the trees on cemetery property get cut annually as needed. This year, because of the wet weather, crews have been prevented from traveling off the paved roads for fear of getting their vehicles stuck. Township administrators hope to have all the trees cut by fall.